Tip: Pre-soak currants in ½ a cup of hot water to soften them up. Drain well before adding. Combine lemon juice, olive oil, dill and currants in a mixing bowl. Top and tail the fennel setting the fluffy fronds aside. Halve the bulbs then slice as finely as you can (either using a mandolin, a very sharp knife or a vegetable peeler). Add the fennel to the mixing bowl and toss with the dressing to prevent it browning. 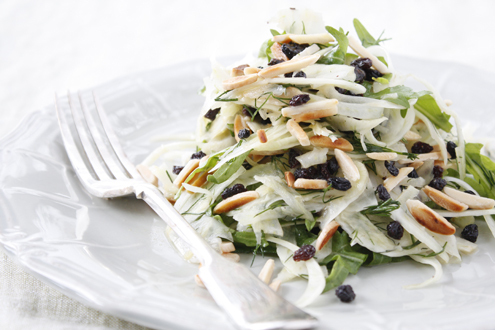 Add fennel fronds, almonds and rocket leaves and a good grinding of black pepper and serve.